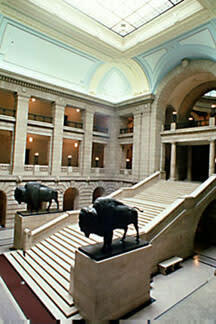 Manitoba's Legislative Building is known to be one of the finest public buildings in North America. 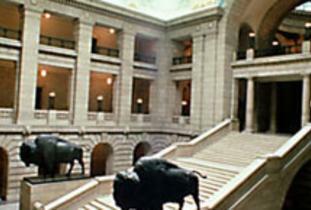 Visitors are always made welcome at our magnificent Legislative Building. When the Legislative Assembly is in session, everyone is welcome to watch the proceedings from the vantage point of the public gallery. The building is open every day from 8:00 am - 8:00 pm for self-guided tours. Our tour guides will be happy to show you the rest of the building so you can share in its fascinating history and architecture. Appointments for guided tours are required from September to June. From July 1 to Labour Day long weekend in September, tours are offered on an hourly basis from 9:00 am - 4:00 pm daily. The Legislative Building is wheelchair accessible, including the Public Gallery. To book an appointment please call 204-945-5813.